A Basic user can upgrade plan to Premium or Advance. Click Select button in the Premium option to opt for Premium Plan. Deployment Type page appears. 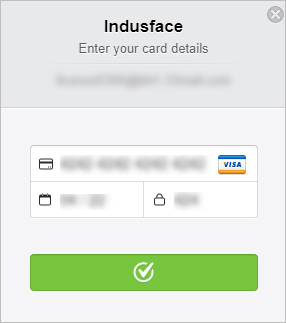 If your domain is a Naked Domain, a pop-up message appears with Manual steps and a link to reach out Indusface Support team. Contact Indusface Support for any further assistance. Reference Figure. Click SAAS switch toggle button to change the default deployment type to Non-SAAS. Click Proceed button to continue with Existing(Saved) Card. To add New Credit Card, click Add Card button. Credit Card Details pop-up appears. Success message is displayed on the top. 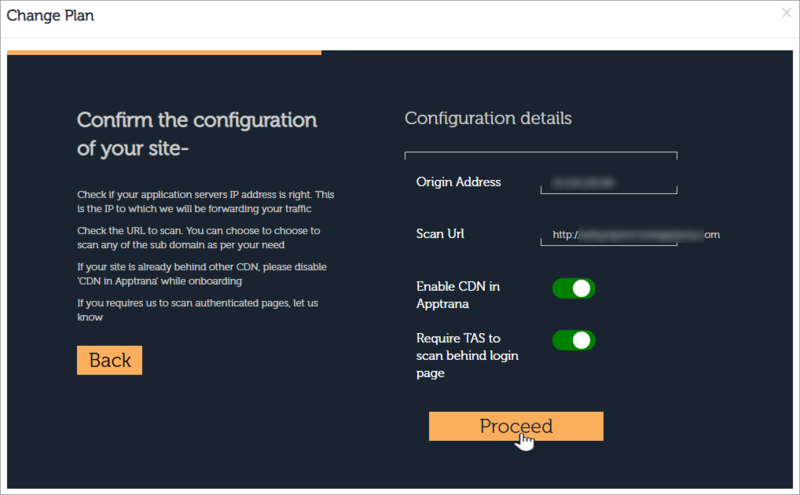 Configuration Details page appears. Click here to skip the other scenarios and jump to Configuration Details page. A user can either go with existing license or add a new license. Click I have my own license button. License Details and Add License button appear. Click Select a Promo code drop-down, click a suitable promo code from the existing ones. If the promo code is suitable, license information is displayed along with Proceed button. Click Add License button. Add License pop-up appears. Click the empty box, copy a suitable license and click Add License button. Click Proceed button. Configuration Details page appears. IP address and Scan Url are pre-populated. As a part of Apptrana offerings, Indusface provides free CDN. 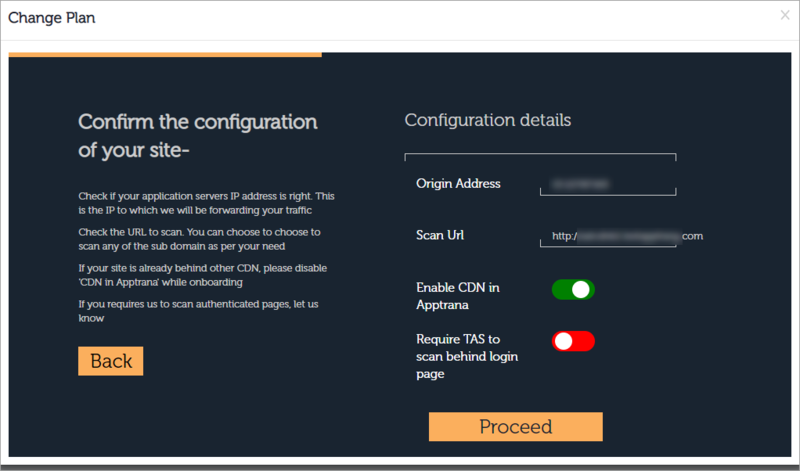 Enable CDN in Apptrana is enabled for the same reason. 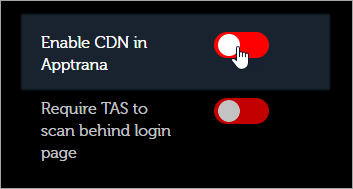 Click CDN switch toggle button to disable it, in case you have your own CDN protection. 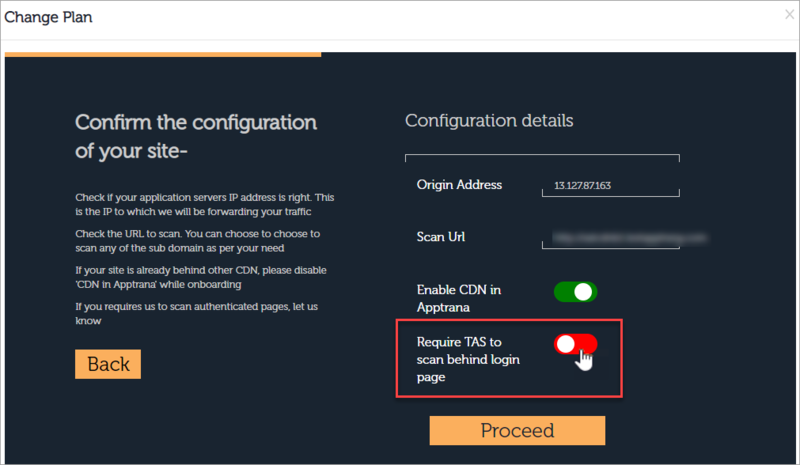 Click Require AppTrana to scan behind login page option for active scans. This option sends an email notification to our support team to request the user credentials to place the website on the scanner. Click Back to navigate back to the previous step. Click Proceed button. 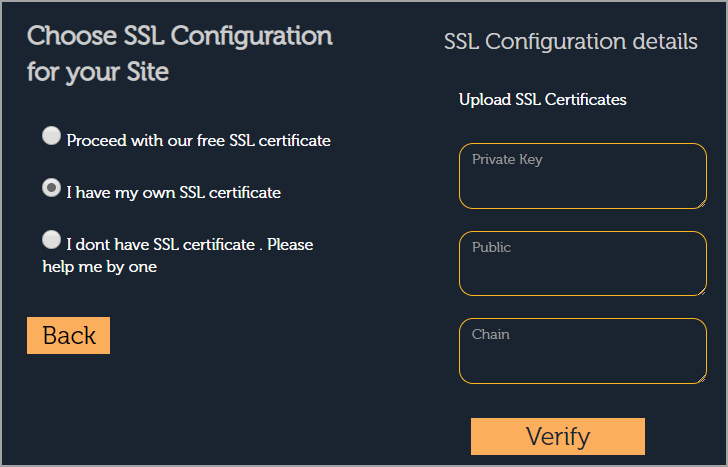 SSL Configuration Details page appears. By default, the 1st option is selected as the page opens. Click Proceed button to continue with our free certificate. The Confirmation page appears. 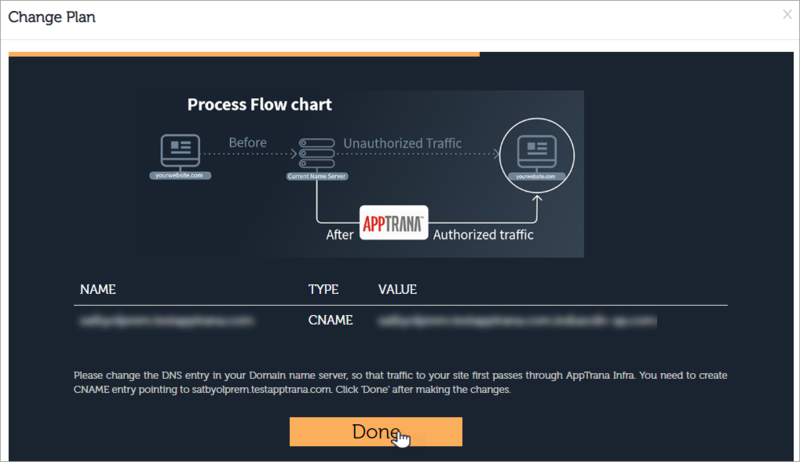 Please change the DNS entry in your Domain Name Server so that the traffic to your site first passes through Apptrana Infra. Create a CNAME entry pointing to your domain. Click Done button to close the page. Dashboard page appears. 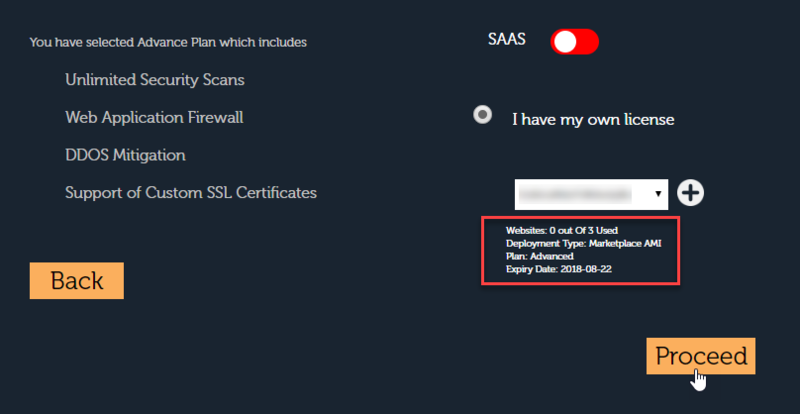 Select 2nd option to upload your own certificates in the given fields and click Verify. Click Back to navigate back to the previous step and click Confirm button in Are You Sure? pop up. Paste the Private Key in this field as is the name. Provide the public Key in this field. 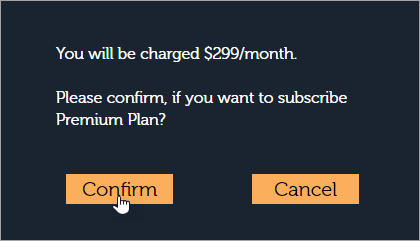 The charge for Premium plan is displayed for confirmation. 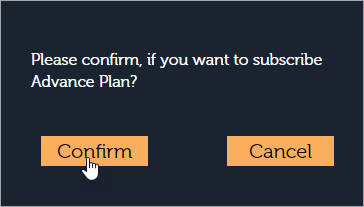 Click Confirm button to continue with the Premium plan. Click 3rd option to seek help from our Indusface AppTrana team and click Proceed button. For immediate protection, our LetsEncrypt certificate will be provisioned temporarily. A user has to upgrade to Premium Plan subscription to continue with the never-ending AppTrana protection. The websites with Marketplace AMI, BYOL, and OVF deployment types are considered as Non-SAAS websites. Credit Card option is not available for Non-SAAS websites. Click SAAS switch toggle button to turn it off for Non-SAAS users. 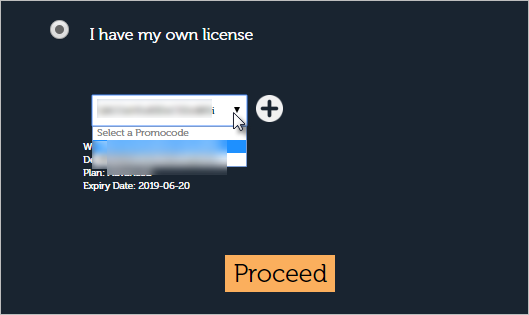 Click Select a Promo code drop-down to upload a license from the existing Promo Codes. Apptrana doesn't provide CDN feature for Non-SAAS customers. CDN is enabled for the Non-SAAS customers with their own CDN. Click Back to navigate back to the previous step, click Confirm button to confirm the action. Click Proceed button. 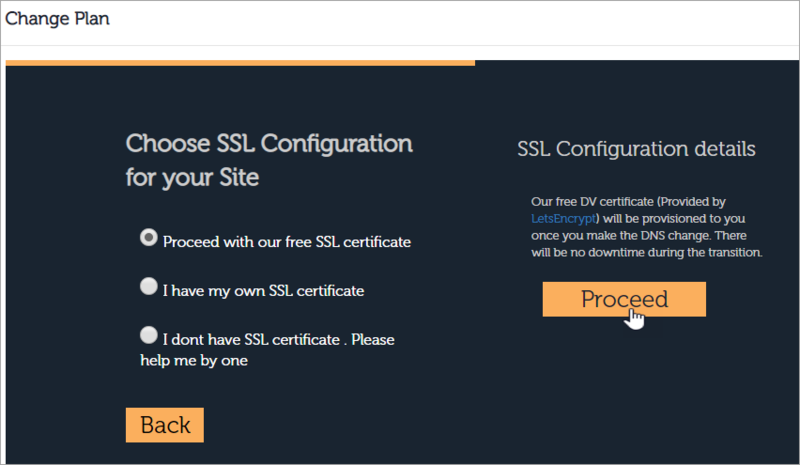 SSL Configuration page appears. Copy your certificates in the given path of your WAF machine. Process Flow chart page appears. The updated plan is displayed in Settings and Dashboard. Click Select button in ADVANCE option to continue with the Advance plan. Deployment Type page appears. If your domain is naked domain, a pop-up message appears with Manual steps and Support Contact links. Contact Indusface Support for any further assistance. Reference Figure. Click SAAS switch toggle button to Off the deployment type from SAAS to Non-SAAS. For a SAAS Website License and Apptrana Trail options are available. Click I have my own license option. License Details display. 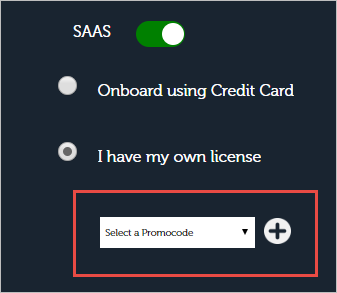 Click Select a Promo Code drop-down, click the suitable promo code for Advance plan and SAAS deployment type. Click here to skip to Configuration Details page from other scenarios. Click Apptrana Trail option. Configuration Details page appears. IP address and Scan Url is pre-populated. 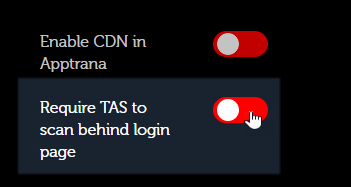 CDN option is enabled if a customer has his own CDN. 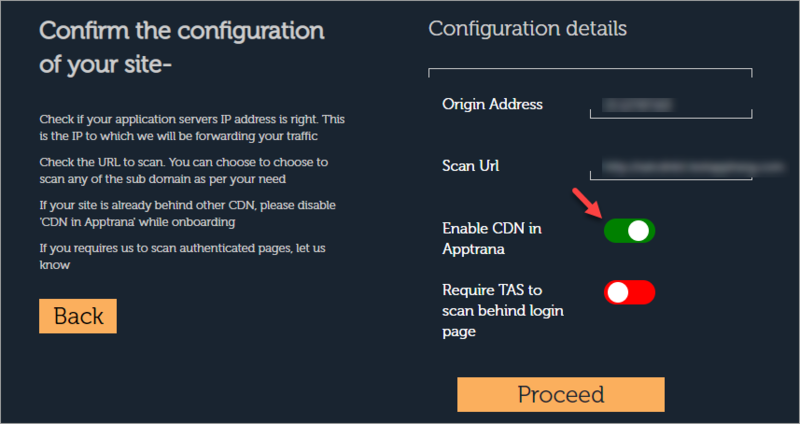 Click CDN option to activate Apptrana's CDN. By default, 1st option is selected as the page opens. Click Proceed button to continue with our free certificate. Confirmation page appears. The final Process Flow Chart displays the flow of the Indusface AppTrana Security provided to a website. Click Done button to close the Change Plan pop-up. Dashboard page appears. Click Back button and click Confirm button to go back to the previous step. The final Process Flow Chart displays the flow of the Indusface AppTrana Security provided to a customer. Click 3rd option to seek help from Indusface AppTrana team and click Proceed button. The final Process Flow Chart displays the flow of Indusface AppTrana Security provided to a customer. The websites with Marketplace AMI, BYOL, and OVF deployment types are considered as Non-SAAS websites. They have only Licensing option compared to SAAS websites. Click Back and click Confirm button to navigate back to the previous step.